Amy from Spunky Eclectic is running a spin-along in her Ravelry group and kindly included David of Southern Cross Fibre and me, as well. 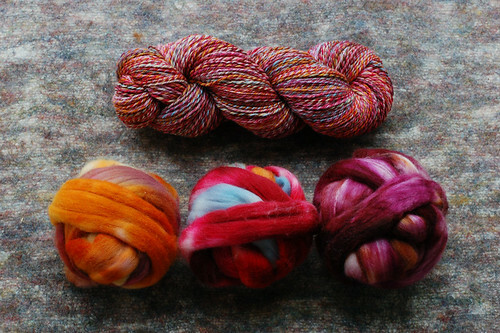 The deal is, you spin a yarn combining different colorways, at least one from one of our three shops. I love combining fibers, so hopped right in as soon as I got back from my trip to SPA in Maine, which was totally awesome and all kinds of fun, by the way. 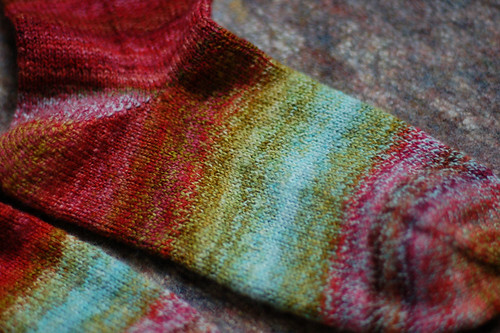 What I thought was just a lark turned into a bit of an education about combining fibers and colorways. 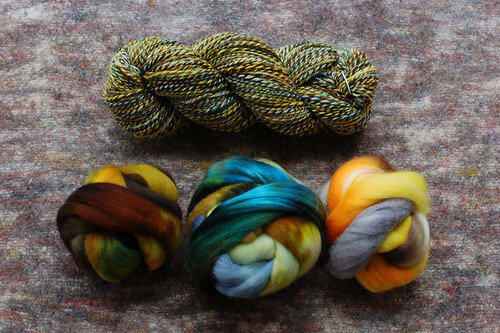 I tend to throw all caution to the wind when combining different wools. 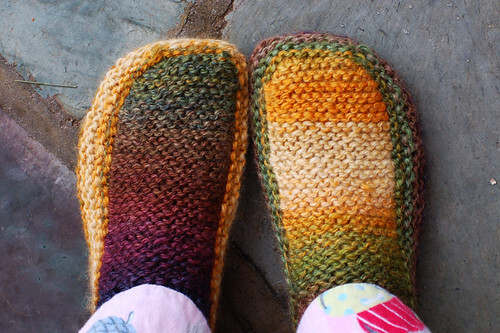 (I do draw the line at mixing regular and superwash wool, but someday I’ll do that to and report back.) Everything worked out just fine, as you can see. 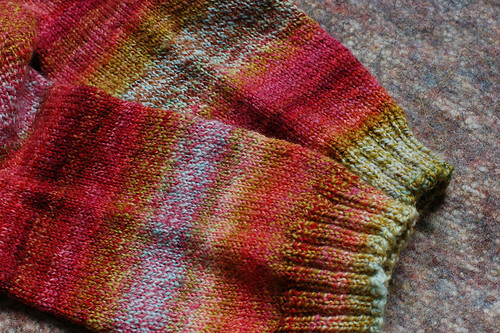 I haven’t knit with the yarns yet, but past experience with mixing wools like I did tells me that there will be no problems. I have lots of older projects kicking around that are made from mixed wools and since we wear our woolens half to death around here, I’m confident these yarns will stand the test of time. 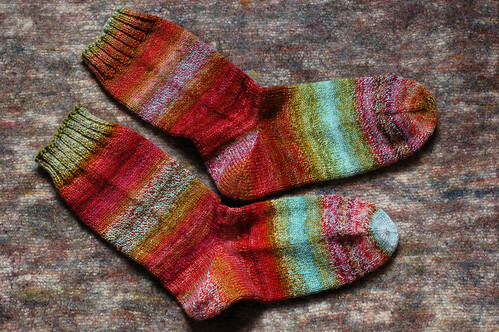 How these yarns work for you will depend, of course, on your needs and expectations. 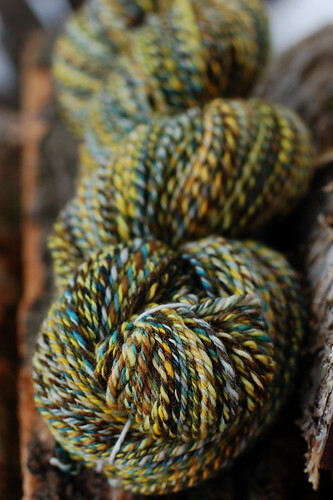 If you’re spinning for a fine drapey sweater, by all means stick to a fiber that will provide the yarn for that job. I tend to spin the yarn and find the project later, after I see how the yarn behaves, so don’t suffer from much inhibition! 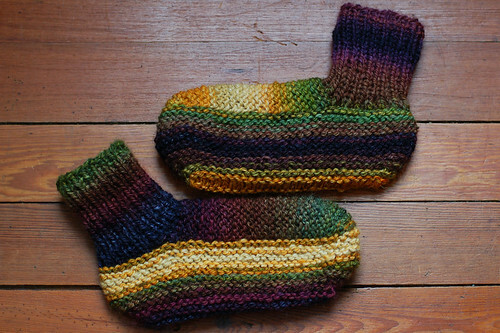 Yarn is one ply of each fiber. Worsted weight, 374 yards, 6.3 oz. This one was made up of three fibers that were pretty similar in value so that the yarn, while made up of a bunch of different colors, is a pretty steady medium value with no bits that scream “LOOK AT ME!” over the rest of the yarn. The yarn as a whole may be screaming just that, mind you. Heavy worsted weight, 334 yards, 6 oz. This yarn was made from one rather dark ply, one that varied, and one rather pale ply, resulting in a crazy mixed up skein. * If you’re ever in Portland, ME, go to Duckfat. Have poutine. Thank me later. 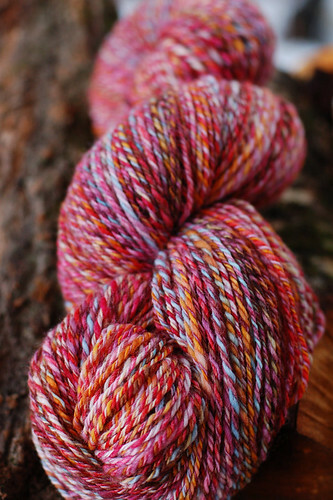 * After that, go to KnitWit and look at all the Quince and Co. yarns in real life glory! * My pie plate broke and I found the most wonderful replacement by Roundroof Designs on etsy. It’s wonderfully made stuff and suddenly I feel the need for a toad house.